A blog about birds, names and the meaning of life. Logically, the list of one-word-birds contains the shortest bird names in the world. Emu, Kea, Tui and Mao all precariously stride the line between names and just sounds. Topping (or bottoming?) this list is the barely-named Ou, comprising – count ‘em – just two letters1. One can but revel in its joyful simplicity. Of course the majority of the world’s birds are not gifted with such brief monikers, and on the opposite end of the spectrum there are some frankly daunting names to grapple with. There are, in fact, eight species on the list whose names comprise a whopping 33 characters, and 109 species with 30 or more. You’ve got to wonder what they did to deserve this sort of shabby treatment. Given that one-word-birds generally earn their names through their unique or exceptional traits, you might imagine that long-named birds would be unremarkable by contrast. This is definitely the case for the Fulvous-chested Jungle-Flycatcher and its cousin the Chestnut-tailed Jungle-Flycatcher, both hitting the 33 character benchmark. 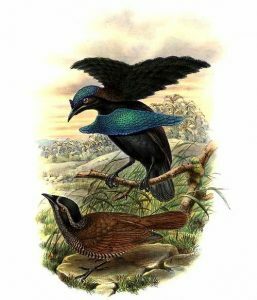 These little birds reside in lowland and montane Asian forests respectively, and both suffer from a bad case of the brownsies. Neither is even particularly notable for its namesake, colourful feature. What colour is fulvous, anyway? 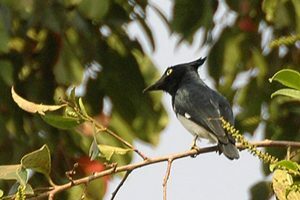 A Fulvous-chested Jungle-Flycatcher (probably) in a not-so-lively state. The Middendorff’s Grasshopper-Warbler, also 33 characters, suffers from a similar affliction. 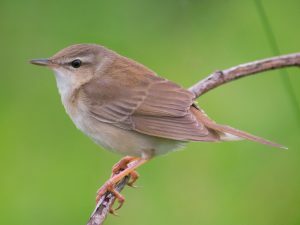 In North America we are gifted with warblers in every brilliant shade of the rainbow, but in much of the Old World the word ‘warbler’ takes on a different meaning. Many of these unfortunate birds are about as plain and as brown as a bird can get, and the Middendorff’s fits right in. It also bears the added burden of being named after Russian naturalist Alexander Theodor von Middendorff, who may have been a fine naturalist but whose name is a bit of a nightmare. Would Alex’s Warbler have been so bad? A Middendorff’s. Be still my beating heart. 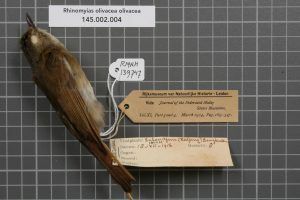 This striking little bird is the unfortunate victim of two common naming issues. First, like many similarly-coloured birds it gets the descriptor ‘black-and-white’, which starts it off at 15 characters from the get-go. Second, when ornithologists were naming birds in the tropics they seem to have run out of bird varieties, so they just started mashing them together. Ergo, shrike-flycatcher. In defiance of its awkward name, this little African bird is an absolute looker. This photo does not do the Black-and-white Shrike-Flycatcher justice. I suggest googling. These closely-related sunbirds are an easy two-for, as they share both similar names and similar appearances. 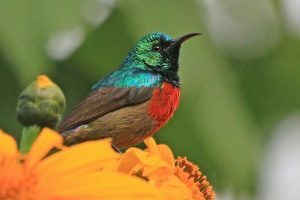 The sunbirds are the Old World answer to the New World’s hummingbirds, and there’s a whack of them so physical features (like double collars) are often used to distinguish the species. Like hummingbirds they feed primarily on flower nectar, and it’s only logical that a bird which uses bright colours to find its food could also use bright colours to find a mate. For this reason, nectar-feeding birds on both sides of the Atlantic tend to be fairly easy on the eyes. A Northern Double-collared Sunbird. So very foxy. 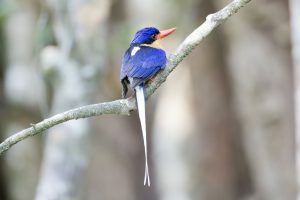 The word ‘paradise’, when it precedes a bird name, seems to universally indicate a ridiculously long tail, and the Buff-breasted Paradise-Kingfisher is no exception. It’s in fine company too, with birds like the Rufous-vented Paradise-Flycatcher (also 33) and the Eastern Paradise-Whydah (a paltry 23) also making use of the word. The paradise-kingfishers are Australian, and look much like other kingfishers until you catch a glimpse of their backsides. Try to do so discreetly – it’s rude to stare. The Buff-breasted Paradise-Kingfisher knows you’re looking. Another victim of the dreaded ‘black-and-white’ descriptor, this African hornbill is a study in the art of hyphenation. It is one of very few birds in the world with a four-word hyphenated phrase in its name, and there’s a (sort of) very good reason for that. If the name was Black-and-white Casqued Hornbill, we would know that the bird was black and white, and also had a casque. But since it’s called Black-and-white-casqued Hornbill, we know that it is the casque, not the rest of the bird, that is black and white. Of course the rest of the bird is also black and white, so it’s somewhat a moot point. 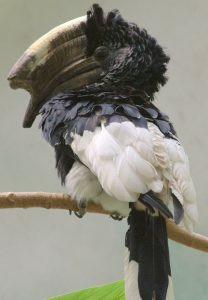 The Black-and-white-casqued Hornbill would like to know if there’s something on its face. It’s fair to say that the birds-of-paradise are working at an immediate disadvantage when it comes to name-length, as the very phrase meant to indicate their incredible plumage is longer than many entire bird names. Add to that the Dutch word ‘vogelkop’ (literally translating to “birdhead”, referencing an Indonesian peninsula where the bird lives) and the completely unnecessary but decidedly accurate ‘superb’, and you’ve got yourself one long moniker. The bird is worth every syllable though, and its incredible mating display is an absolute must-see2. Free photos of the Vogelkop Superb Bird-of-Paradise are hard to come by, but Google will help you out. I stand fast in my belief that one-word-birds are special and unique, but I would be terribly narrow-minded if I didn’t concede that there are other incredible birds among the roughly 10,400 with multi-word names. I suppose it’s only right to take a moment to recognize some of them. Needless to say, if I was responsible for bird-naming, the Ou would stand in much more ample company. 1The Hawaiians actually spell this name ʻŌʻū so it seems a bit like cheating to count just two characters, but as always here at OneWordBirds we accept the Clements Checklist as gospel (except when we don’t agree with it – see Lammergeier). 2And thanks to the magic of technology, you can see it! Complete with narration by James Earl Jones to boot: https://www.youtube.com/watch?v=7dx2CUMtZ-0. He omits the word ‘vogelkop’, but again, Clements is god.